Juhlapesu Lohja has a good location next to Citymarket, regional hospital and large suburbs. “Some customers come from as far as the neighboring towns and the wash bay has traffic pretty much all through the day apart from a couple quieter hours during the night. The early bird customers arrive around 5am, and there is a peak hour at 8pm when the Night subscription customers come in”, says Eriksson. Customers come from all age groups. Both private customers and businesses use Juhlapesu in Lohja. Before becoming a Juhlapesu entrepreneur, Eriksson worked in hospitality industry at Restel and Shell. Car wash business was something he became familiar with alongside his hospitality career. 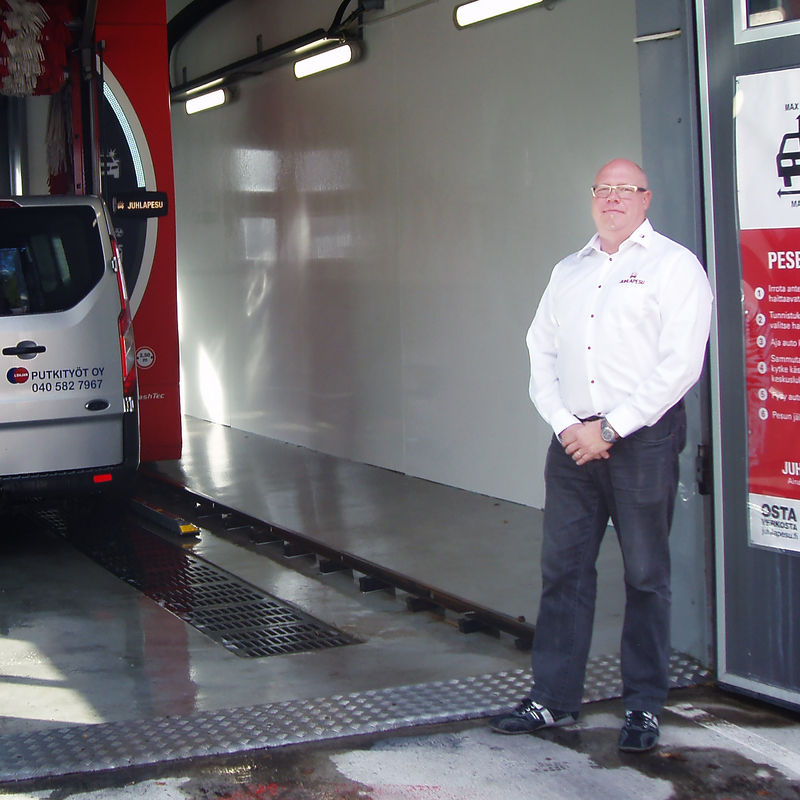 Due to environmental issues, some car wash operators had to retire their services in the area, and Eriksson spotted an opportunity. He discussed Juhlapesu for a good while with ProWash, and it wasn’t before a suitable site came along that Eriksson was able to act on his idea. “The site was a city owned piece of a forest that was planned for fuel distribution”, tells Eriksson. He rented the site from the City of Lohja, built the car wash property on site himself and rented the rest of the plot for a fuel distributor. People stopping by to fill their tanks are also potential car wash customers. Eriksson has managed to turn many of them into Juhlapesu customers as well. “This is mostly about sales and customer service – these two things are imperative. The technical side is easy to learn and manage”, says Eriksson. “I am on site almost every day at least for a while. I chat to my customers and ask for feedback.” Eriksson is a familiar face to Lohja townspeople by now: “An unmanned site does not mean a faceless site”, he points out. Eriksson has an outsourced direct sales service in use as well to support the growth of his business. Erikssons business customers include large companies such as Posti and RAY among others. Juhlapesu Lohja is located in Tynninharju, at Holmankuja 2.